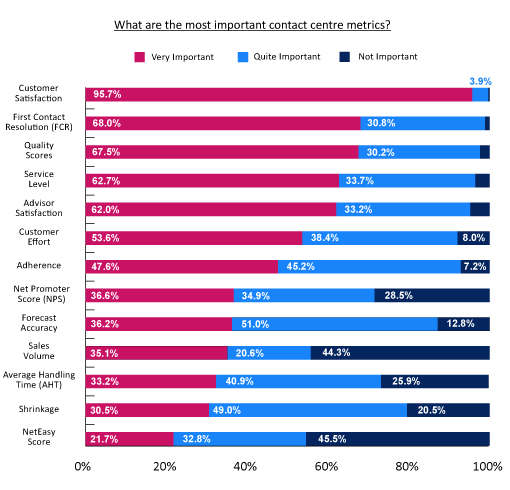 Here is our definitive top ten list of contact centre reporting metrics, chosen by you. In our December 2017 report “What Contact Centres Are Doing Right Now – How Do You Compare?“, we asked over 380 contact centre professionals what they thought were the most important call centre reporting metrics. By replying, they helped to provide us with a top ten list of contact centre metrics, which are highlighted below. An old favourite that looks at the percentage of customers that are happy. This is generally simple and easy to operate, but there is no universally recognised approach to measuring Customer Satisfaction (CSat). It can be carried out through a wide range of methods, the most common being a post-call IVR survey or a follow-up email survey. This survey would usually include a question along the lines of: “How satisfied were you with our service today, on a scale of 1-10?” An average score would then be calculated from all the responses given. 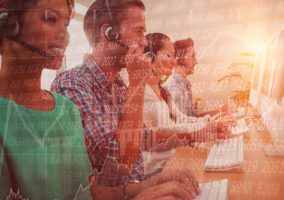 While many newfound measures of customer success, loyalty and emotion have entered the industry, Customer Satisfaction remains a pivotal part of the call centre metrics kit. Why? Most likely because it helps to provide a great indication of customer intentions, lifetime value and customer churn, among other reasons. 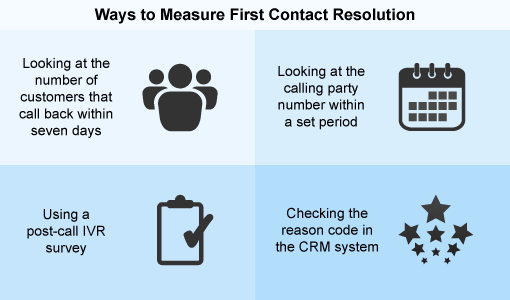 Also known as ‘Best Contact Resolution’, this is a very common metric and looks at how many times a customer needs to call a company to get a problem resolved. It is also a very good way of measuring a problem from the customer’s perspective. The problem is that it is quite difficult to accurately measure and tends to be rather subjective. For example, a repeat call could be about a different problem. To remove the subjectivity, some contact centres are now beginning to measure FCR across their most common contact reasons, so that each has an individual score. This helps to show which call types are resulting in the most call-backs, instead of having a subjective overall score for the contact centre. Quality Scores are a measurement of advisor performance in most contact centres, as they provide the ability to assess the overall caller experience, while focusing on the conversations that advisors are having with customers. While these scores can be accumulated to track how well the contact centre is performing, they are more generally used at an advisor level. This allows the contact centre to single out advisors and teams that may need more coaching time or, conversely, highlight those who deserve a reward. Typically, a contact centre would have a “quality team” that will listen to the recordings of five or six calls per advisor every month. They would then fill in a scorecard, ticking boxes to indicate whether the advisor was able to do things like greet the customer kindly, show empathy and so on. An average quality score can then be calculated for an advisor each month. 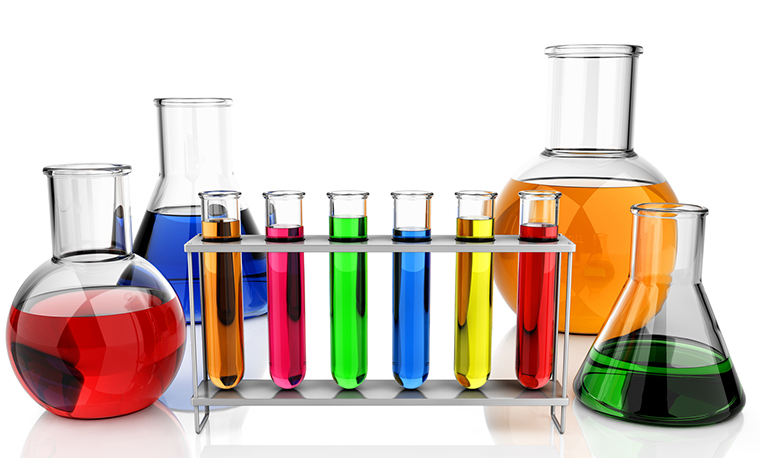 However, as some of the criteria are subjective, it is important to hold quality calibration sessions to remove any suggestions of bias from the team. This was one of the very first metrics to be produced by ACD systems. It looks at the percentage of calls that are answered within a given time. This was the only efficiency-based metric to make the top ten, with the others being based on quality and outcomes. The average figure seems to be between 80% of calls answered in 20 seconds and 95% of calls answered within 15 seconds. Pleasingly, this was the only efficiency-based metric to make the top ten, with the others being based on quality and outcomes. However, this still made the list, most likely because of its importance when working out how many advisors are needed in the contact centre at any given time to lower queue times for customers. Just remember, advisors should not be pressured to rush through calls just to meet service level, it is best used as an operational metric, not as a quality measurement. This is a measure of the contact centre team’s happiness, which, like CSat, can be measured in many different ways. While many contact centres choose to simply conduct an end-of-year survey, it is now becoming more commonplace to measure Advisor Satisfaction more frequently. Calculating a Quarterly Employee Net Promoter Score (ENPS) is a good alternative. Or the contact centre could instead simply ask advisors a question such as: “On a scale of 1-10, how happy are you at work?”, every three or four months, and track the change to the average score of the entire contact centre. 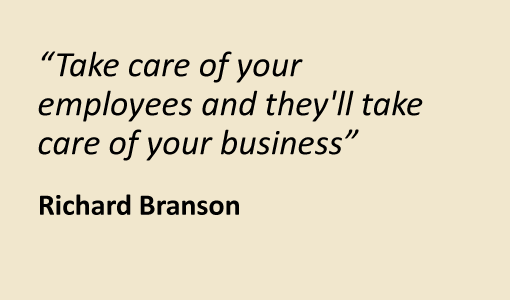 For more on this topic, read our article: How Do I… Measure Employee Engagement? Customer Effort is usually tracked through calculating a Customer Effort Score (CES), which is again measured through customer surveys. On this scale, 1 would mean that it was an interaction of low effort and 5 would indicate that it required a lot of effort on the customer’s part. The average scores are then tallied, which would be somewhere between 1-5, with the lower the number, the better the result. In 2016, only 37.6% of those surveyed believed that Customer Effort was a very important metric, which highlights the metric’s growing popularity. This rise could be due to research suggesting that effort has a greater impact on customer loyalty than delighting customers. Adherence is a metric that calculates a percentage figure for the amount of time an advisor spends working compared to their schedule – whether that’s on the phone, completing after-call work (ACW) or any other scheduled activities. For example, if an advisor is scheduled to take calls from 3pm to 4pm, but was five minutes late and takes calls from 3:05pm-4:05pm, they were only at work for 55 of their scheduled 60 minutes. This means that the advisor’s adherence percentage would only be 91.6%, as highlighted below. This metric is often confused with others, including conformance, occupancy and utilisation, but it is used widely in call centres, as the industry is often the victim of high levels of absenteeism. Similarly to Quality Scores, this metric is often calculated at an individual advisor level as well as across the whole contact centre. For a complete rundown, read our story: How Do I Calculate… Schedule Adherence? Given the amount of hype that the Net Promoter Score (NPS) has generated, it is surprising to see this so low down the list. It looks at the number of people who would recommend the product or service to their family or friends. This metric has had a huge amount of airplay in the past few years and has been promoted as the one metric that can be used to predict customer loyalty. This metric has had a huge amount of airplay in the past few years and has been promoted as the one metric that can be used to predict customer loyalty. In many ways it is similar to Customer Satisfaction, but it tends to take a more binary approach to measurement. Yet it seems that this metric is not as popular as it once was. For many companies who have used it, after some good initial results, they have seen their results level off. It is also influenced quite highly by factors outside the contact centre – for example, pricing policy, news in the press and overall branding. This is a favourite among workforce planners who look at the accuracy of their overall forecasts, as they try to figure out how they can improve their future results. Most do this by finding the percentage difference between actual volume and the forecast volume expressed as a percentage. So, if a contact centre was forecast to handle 90 calls in a half-hour period but it actually received 100 calls, the forecast was off by a factor of 10%. 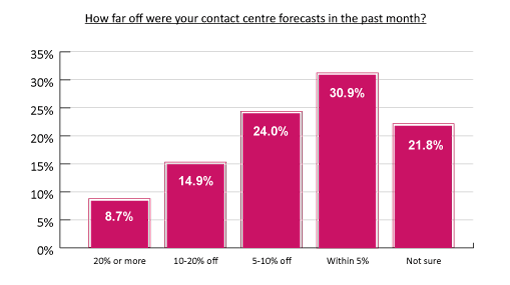 When we looked at this metric in a recent report, we found that most contact centres have a forecast accuracy of better than 10%, as highlighted below. This is because forecast accuracy is highly influenced by external factors such as the weather, marketing and the post, which can result in unexpected peaks in contact volumes. Sales volume is the number of sales that an advisor or a contact centre makes over the course of a certain time period or per X number of contacts. While this is no doubt a crucial metric for sales-based contact centres, to assess both performance and lead quality, it has no real use to many of those surveyed, who are instead likely to be from customer-service-based contact centres. SHOCK RESULT! – Average Handling Time Misses Out on the Top Ten! In a surprise result, only 33.2% of call centre professionals view Average Handling Time (AHT) as a “very important” metric. While, like Service Level, it is still important when using an Erlang Calculator to work out the number of staff needed in the contact centre, the result could reflect changing attitudes towards the use of the metric as an advisor target. This is because many have cast their doubts over whether doing so is in the best interest of the customer, as advisors start to rush through their calls to avoid missing their objectives. We discuss this further in our article: Want to Increase Customer Satisfaction? Stop Measuring Average Handling Time! Do you agree/disagree with our list? Which other metrics would you have included? Originally published in July 2012. Updated and republished in January 2018. Well you missed the most important one, staff satisfaction! Engage with your staff and you will find most of the other SLA’s will be delivered. speed of answer and 95% calls answered are not very inteligent metrics. what happens if you answer only 94% of calls? nothing so…. Dissapointed that employee engagement didn’t get into the top ten and yet AHT came in 5th! Reallly? That explains a lot! Others to consider…Contacts per sale(order), Cost per Contact and Cost per Sale. Amazing that Quality has come to to the top, however it may be too simle to just say Quality as Customer Experience Quality (i.e. sentiment measuring) is as important to measure Agent Quality. Cost per call minute or process minute split by call or process type. In my opinion we should look for all the KPI’s that influence the five key contact centre challenges. 1:Cap or reduce costs. 2:Increase efficiency 3: increase revenue 4: Reduce risk. 5: increase customer satisfaction. Only when we have absolute, measurable control of operational costs do we have the basis to develop ROI models. It’s ONLY ROI that the boardroom is interested in. With substantiated ROI data all initiatives and investments designed to address the 5 challenged are possible . Could not agree less with the Quality Scores one, even though Quality is my own number one preoccupation. In my experience, Call Quality monitoring is done by bored-out-of-their-minds ex-agents who tick boxes like “Used the Corporate Greeting” or “Used the customer’s name 3 times”. Since when has that got anything to do with the customer experience? The only opinion that really matters is that of the customer. Why not ask them what they think, instead of relying on meaningless data from inside your own organisation? It’s important that these metrics don’t get the way of providing an actual customer experience. AHT is important, but does chopping five seconds off your average mean all that match when the caller calls back in an hour? I would think that the top 10 KPI’s would be dependent on the organizations goals. The company that wants loyal customers who will stick with them when the competition is strong had better be looking at customer satisfaction/NPS scores, contact center staff satisfaction, and cost per call as leading indicators for the other metrics that drive business. Ease of experience for the customer is the strongest driver of customer loyalty. How easy is it for a customer to have their need met? Someone is asking why cost per call. Easy, its a business, cost per call should be looked at for change in value, not for how much it is costing. What the customer needs to resolve their need may just cost more than others. 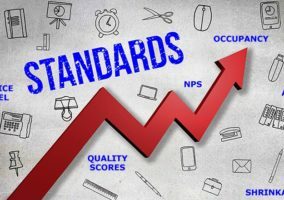 Look at what is driving that KPI using Lean Six Sigma techniques. Someone knows the meaning of the Ex metric? Can anyone define Email Per hour metric concept in call center? I stopped scoring quality years ago and it was the best thing I have ever done. Scoring contact quality is divisive, political and prevents effective performance management and improvement. My advice, if you want to improve quality, is to stop scoring individual agents now. Then you can focus on improving quality and customer needs.